One of the folks who contributed expertise to the “Parker’s Revenge” project I discussed yesterday is Daniel M. Sivilich, president of the Battlefield Restoration and Archaeological Volunteer Organization and author of Musket Ball and Small Shot Identification. Starting on the Monmouth battlefield in the late 1980s, Sivilich has been collecting musket balls and other metal shot—which isn’t that hard in New Jersey, the “crossroads of the American Revolution.” But he’s also analyzed and categorized those artifacts in ways that shed more light on them, and thus on the lives of soldiers and the action of battles. The “Parker’s Revenge” project found 32 musket balls; 31 showed signs of having been fired, and the last one was pristine enough to have been dropped. Sorting the fired balls by weight produced a clear pattern: those found at the expected British position were on average lighter than the balls found around the provincial position. That data matched the hypothesis of the Lexington militiamen firing at the British with smaller-caliber muskets and then withdrawing under fire from the regulars’ heavier shot. I got to hear Sivilich speak about his work toward the end of this project. Among other topics, he spoke about chewed musket balls. Seventeenth- and eighteenth-century writers accused their enemies of chewing musket balls in an attempt to poison whomever they wounded, as shown in quotations here. Later, as Sivilich wrote in his first paper from 1996 (P.D.F. 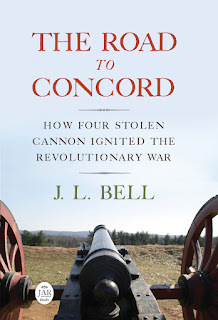 file), authors came to associate biting on a musket ball with soldiers undergoing painful surgery. Several chapters of this book are devoted to the different ways that spherical lead projectiles were misshapen: imprecise casting; impressions made by ramrods, multiple projectiles, and fabric patches during loading; and the wide range of deformation caused by impacts. If you’ve wondered how a ball that struck a fence rail different from one that hit a tree, or how to distinguish a ricocheted ball from a spent one, this book will explain it with words and pictures. Over 300 pictures, in fact. Let’s face it: this book is a detailed dive into a technical subject. But for folks working on eighteenth-century battlefield archeology, it’s a must.